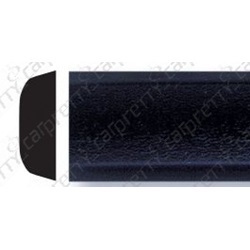 This product is an all black flexible body side molding that comes in a roll in various lengths. There is 3M automotive grade tape already on the back of this molding which makes installation easier and gives it longer durability. This molding will protect your vehicle from parking lot door dings. Also these moldings are not painted but are manufactured with a process that bakes the color into the molding. That means no chips!